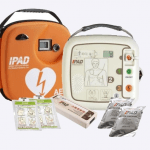 We have now had confirmation that we have been awarded a grant by The British Heart Foundation towards an iPad SP1 defibrillator. This will be located at The Village Hall so that it is easily accessible to anyone who may need it – it should be installed within the next few weeks. Hopefully, this will never be needed but will provide peace of mind to all the residents of Pentridge and Woodyates and will be at hand should anyone need it. Well done and thanks to everyone who helped raise money towards our Defibrillator Fund. This entry was posted in Local News, Pentridge Village Hall. Bookmark the permalink.